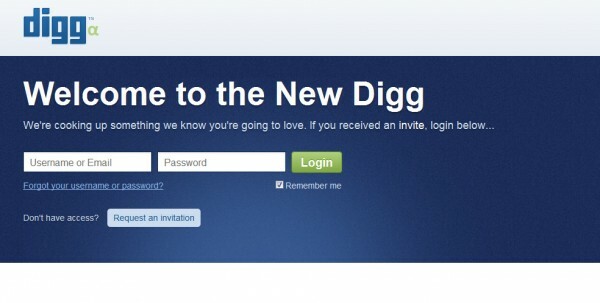 As some Digg fans may already know, the popular link sharing site has been working on a major redesign for over a year now with an emphasis on making the site more social networking friendly. The redesign is now in alpha, but interested users can sign up at new.digg.com to check out all its new social features and overall layout. After using the new Digg page and comparing it to its hugely successful predecessor, it is clear that the site is heading in a different direction; the real question, however, is whether or not this new direction will be appealing and/or helpful to Digg users. The new Digg looks like a hybrid between Facebook, Twitter, and Google Reader. Users can now subscribe to a list of recommended sources like CNN, The New York Times, or The Wall Street Journal, as well as individuals like Nine Inch Nail’s Trent Reznor or Digg’s founder Kevin Rose. Another new feature is the ability to follow your friends on other social sites like Twitter and Facebook. Once you’ve subscribed to and are following all of your favorite people, Digg then creates a new “My News” home page for you, which compiles the links submitted by the sources you’re following. For users who prefer the traditional Digg newsfeed, there is a tab in the upper left hand corner called “Top News,” which brings up a list of the top headlines and looks just like the old site. There is a list on the right hand side of the My News page entitled “Top News from people you follow” as well, which shows the most popular stories (ranked by highest number of diggs) dugg by your friends. Finally, and possibly most importantly, this redesign makes it easier to submit a link to Digg. There is now a box at the top of the home page where you copy paste the link you want to submit, and Digg pulls up the appropriate title and picture, and, after simply clicking the “Digg it” button on the right side of the box, the link is published and showing up on all your followers’ newsfeeds. In a video he released back in May (which you can see below), Kevin Rose explained that this new design would help get more stories and content seen by more people. He states that on the previous site page the most popular and successful links were the ones that made it onto the home page where the most people could see them; however, only about 120 to 140 lucky links were able to make it to the home page. Now, under the new design, more people will be able to see the content you’ve submitted because it will appear on your followers’ home pages. If they digg it, it will then show up on their followers’ home pages, and if they digg it it will show up on their followers’ pages, and so on and so on. In theory, this chain reaction will spread links to more people than before. This new Digg does have a potential drawback. There is the possibility that people who look only at the My News page may, since more often than not friends usually share the same interests, end up seeing the same links and stories over and over again. I do feel, however, that it will be very easy to circumvent this by simply subscribing to various diverse sources, or, even easier, to just click the Top News link to check out what’s popular outside of your own little circle of peers and interest groups. I do think that it will take Digg veterans a little while to get used to the new social Digg’s layout, and some may find it frustrating that it has become so similar to Facebook and Twitter; I myself am not a huge fan of the Twitter-like layout, and would have preferred something just a tad more similar to Digg’s original design. Overall, though, I feel that Digg is heading in the right direction with this redesign and that, if it works the way it should, this new layout will get more links to more users, which is ultimately what Digg is really all about.